Mrs. Thompson advocated for bringing more women into all aspects of design. Jane Thompson called herself an “architect without portfolio” — a nod to her lack of formal training in the profession. Yet as a designer and urban planner, an editor and a writer with a sharp eye and precise thinking, she helped transform urban shopping through the Faneuil Hall revitalization 40 years ago and in like-minded reinvigorations across the country. With a mind that connected the disparate parts of design into a seamless aesthetic, she worked alongside her husband, the architect Benjamin Thompson, whose vision turned a down-on-its-luck Quincy Market into what he dubbed a “festival marketplace,” a concept that was lauded and much-imitated after it opened in the bicentennial year. A connoisseur of beauty and elegance in the commonplace, Mrs. Thompson saw the importance of tiny details many grand visionaries might overlook. 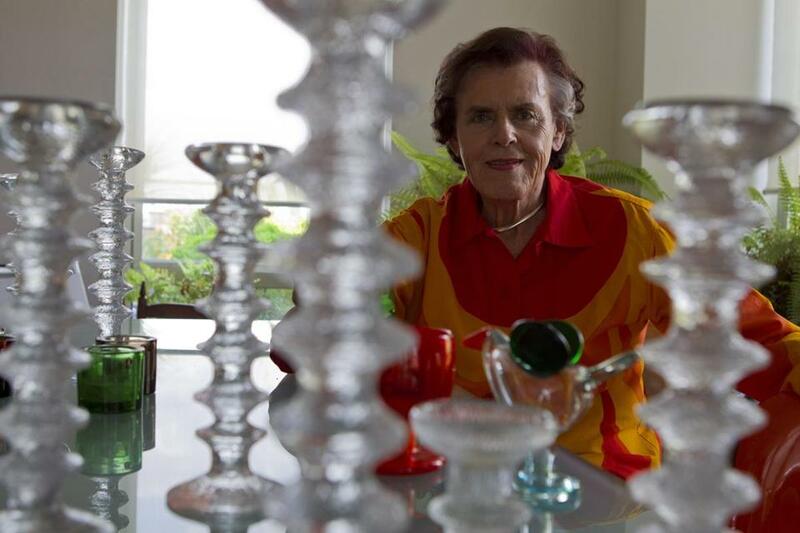 “Can openers, candlesticks, bedsheets — if they’re well made, they should be displayed,” she once told the Globe. Mrs. Thompson, who in 2010 received the Cooper Hewitt, Smithsonian Design Museum’s Lifetime Achievement Award, died of cancer Aug. 22 in her Cambridge home. She was 89. During her career, she advocated for bringing more women into all aspects of design. Then in 2000, she was the recipient of an honor for which there was no adequate title, when the Finnish government knighted Mrs. Thompson and her husband. The couple’s design contributions included championing fabrics from the Finnish company Marimekko. In her late-20s, Mrs. Thompson was a founding co-editor of the magazine Industrial Design, later known as I.D., and she joined Ben Thompson’s Boston architectural practice in the 1960s. They married and went on to collaborate on festival marketplaces, the Harvest restaurant in Harvard Square, and the iconic retail store Design Research, or D/R, on Brattle Street in Cambridge with its all-glass exterior. For Mrs. Thompson and her husband, who died in 2002, design “was a way of enhancing life, and I think that distinguishes Jane from other designers. Her care always was to create social spaces, to create places that enlarged and energized life,” Leers said. With the Lifetime Achievement Award, the Cooper Hewitt, Smithsonian Design Museum praised Mrs. Thompson’s six-decade career and her pioneering revitalization projects such as Faneuil Hall, the Grand Central District in New York City, and Chicago’s Navy Pier. “I find longevity proves something,” she later said in an interview for “Twenty Over Eighty,” published this year by Aileen Kwun and Bryn Smith. Born Jane Fiske in Champaign, Ill., she was the daughter of David Fiske and the former Ahna Anderson. With her parents and younger brother, she moved to New York’s Westchester County and wrote for the newspaper at New Rochelle High School. Mrs. Thompson graduated from Vassar College and worked at the Museum of Modern Art in New York with Philip Johnson, director of the architecture department. “I never saw a woman in a design office in all those years,” she said in the “Twenty Over Eighty” interview. The experience helped shape her view of the need for women and men to work together in the field. Mrs. Thompson, who also did graduate work at the New York University Institute of Fine Arts and studied creative writing at Bennington College, was editor of Industrial Design magazine in the late-1950s. Her marriage to Paul Mitarachi ended in divorce, as did a marriage to John McCullough, with whom she had two children, Sheila and Allen McCullough, who now lives in Brooklyn, N.Y. Formerly a partner in Benjamin Thompson and Associates, Mrs. Thompson headed the Thompson Design Group after her husband retired. When the couple opened their Harvest restaurant in the 1970s, she grew some of the produce, years ahead of the locally grown movement. “You just couldn’t easily buy things like sorrel then,” she told the Globe in 1993. Meanwhile, the couple’s Willard Street house in Cambridge was home to Bauhaus chairs and bright Marimekko fabrics. The back wall was glass, which allowed Mrs. Thompson to gaze at her roses outside while playing her harpsichord inside. Her attention to detail was unsparing. While preparing a design to remodel the kitchen, “I made the sketch showing every pot, pan, and dish on the shelves,” she said in 2003. In addition to her children, Mrs. Thompson leaves her stepchildren Gale McCullough of Ellsworth, Maine, Jill McCullough of Canterbury, N.H., Deborah Thompson of Lexington, Benjamin Thompson Jr., Nicholas Thompson, Anthony Thompson, and Marina Thompson; three grandchildren; 11 step-grandchildren; and three step-great-grandchildren. Her immediate family is planning a private burial. “To the very end, she just always wanted to be working,’ her daughter Sheila said. In 1993, Mrs. Thompson received Institute Honors for Collaborative Achievement from the American Institute of Architects, and a Personal Recognition Award three years later from the Industrial Designers Society of America.